Senior of the Year Isha Varma moved around a great deal in her childhood, living in places such as Pennsylvania, Virginia, and Michigan before her family decided to settle down in Utah. Varma lived here until she was 18, at which point her educational career led her to Westwood, where she began her impressive career as a Bruin. 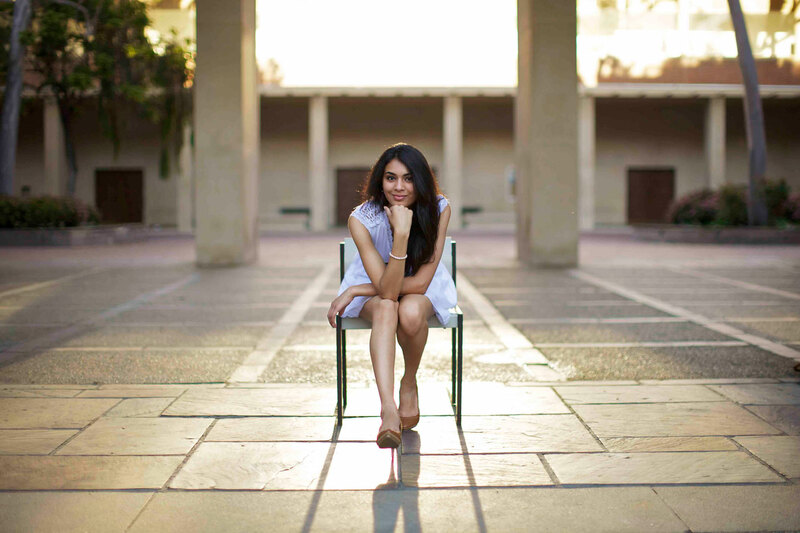 Even in her freshman year, Varma took advantage of what UCLA had to offer, involving herself in on-campus organizations such as Fashion and Student Trends (FAST). “I joined FAST right away because I’ve always been into fashion, and I wanted a way to artistically channel myself. I kind of wanted to be a designer when I joined, but I realized I didn’t have enough time or skills to do it, so I joined as a model instead. You would think that being in fashion club, you’d get a bunch of superficial people who are really materialistic, but I got really lucky and got to meet a bunch of genuine, real, caring people. It’s something that I’ve stuck with for four years,” she said about the organization. Varma also founded Maximizing Potential Abroad (MPA), an organization on campus that worked in community service in other countries. She commented, “I think you have to look at society’s fields collectively and all the fields are interconnected. I wanted something that was more comprehensive, and we do community service in everything. The reason that’s fun for me is because I get to do something I love doing, and I get to talk to a bunch of other people that love it as well. I get to learn about so many other cultures, and we get to talk, bond, and spend a lot of time together. I just love getting to know people.” Varma also made it clear that for her, MPA was as much about giving back as it was about learning. “We treat service as a two way street; it’s not just us delivering food or resources to other people – we learn from the people we help, too. I think that sets us apart from other organizations,” she said. Like most students here at UCLA, Varma spent her freshman year living in the dorms, and recalled it as an unforgettable experience. “My floor on Hedrick 4 North bonded really, really well and a lot of us are still friends. We had great times and did some pretty ridiculous things. I remember we would steal the furniture from other lounges, or put all the furniture from our lounge in other rooms and have little mini-wars,” she joked. Many of the friends she made during her time spent in the dorms remain close to her today, as well. “Some friends and I used to go to Rendezvous to eat every Wednesday, and eventually Wednesday became ‘burrito loving day.’ We got our whole floor to start coming out with us every week, and the staff even got to know us personally. We started calling it ‘Wendezvous,’ and we continued the tradition through sophomore year. Even when we all moved into apartments, we still kept it going. Now, as seniors, we still try to do something like that every week, and there are still about 7 or 8 of us that show up,” she described. Upon graduating with a degree in psychology, Varma hoped to “really solidify the relationships [she has] made over the last four years,” before pursuing non-profit work overseas. After working with non-governmental organizations for one or two years, she plans on pursuing a Master’s in Public Health. “I want to get myself involved in community health sciences. Once I finish that, I’ll decide if I want to do more school or not. Ultimately, I hope to work with the World Health Organization (WHO), the United Nations or nonprofit organizations on international health or international development,” she said. Despite taking such ambitious dreams from her experience at UCLA, Varma also took with her a new image of herself. “UCLA has given me the comfort of being able to pursue my own dreams, and it made me question my dreams, as well. It hasn’t been an easy road, and there have definitely been challenging times, but I wouldn’t regret any of those. You learn so much more from those than you do from an easy ride. My freshman year, I came in really confident in myself and really sure about everything. This sounds so negative, but I think UCLA kind of broke all of that down in a way, and made me go through each part of those things, every piece of what I was sure about, strategically so that I could understand my foundations in myself a little better,” she explained. Still, Varma’s journey in understanding herself wasn’t quite yet over. “I think being at UCLA hasn’t made me who I want to be, but it has made me decide how I want to be, what kind of person I want to be,” she said. “I really just want to be that person that you walk by in the street, and you pass me and you’re like, ‘Wow.’ I just want to emit a positive atmosphere, positive energy. And I don’t think that it’s something that’s not achievable; I think it’s something that takes a lot of work, and everyone can be that way,” she continued. With such a successful college career behind her, it is more than likely that Varma will find success in her future, and will have little trouble getting “wows” from those who find themselves in her company.